Because of their small size and simple shape, seed beads lend themselves to a variety of techniques. Learning the basic bead designs will allow you to make any number of beautiful projects. The Peyote stitch is a popular technique for seed beading, since it is versatile and easy for beginners. Once you learn this stitch, you'll be able to try variations to create unique designs. You can also make attractive patterns with the beads by using multiple colors. Work over a shallow dish or plate to keep the seed beads from rolling off your work surface. If you'll be using multiple bead colors, use small dishes for each one. Thread the needle, and slide one bead onto the thread. Tie the thread around this bead to secure it. Slide several additional beads onto the thread. 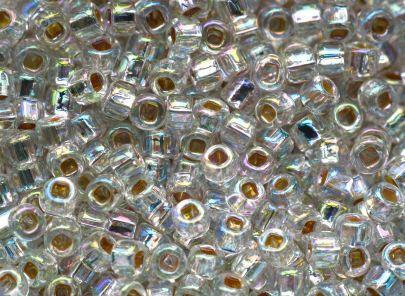 The number of beads you use will determine the width of your project. For a simple friendship bracelet, start with five beads. Add another bead, but don't slide it all the way down the string. Instead, leave the bead loose, and bring the needle back through the second to the last bead on your string. Pull the thread tight. Repeat this step, skipping every other bead, until you finish the row. Go on to the next row, adding beads until your project reaches the desired length. Tie off the final bead. Many beading projects require you to understand the ladder stitch. Fortunately, this stitch is very simple. With practice, you'll master it in no time. Work in the shallow dish to keep the beads from rolling away. Thread your needle, and slide two bugle beads onto the string. Tie the string around the first bead. Slide the needle through the second bugle bead in the opposite direction, allowing the thread to wrap around the bead. Gently pull the thread to secure the two beads side by side. Slide another bugle bead onto the string, and then bring the needle back through the last bead. You'll now have three beads in a row. Continue this process until your ladder-stitched piece is the desired width. Many projects use right angle bead weaving as part of the design. This easy stitch will allow you to create a variety of beautiful jewelry pieces and accessories. Tie the first bead on your string, and then add three more beads. Adjust the beads to form a loop, and bring the thread up through the first three beads. Pull the thread tight. Add another three beads, and adjust them to form a second loop. Bring the thread through the closest bead in your first loop, and then continue around the circle. When you're done, you'll have a figure-8-style shape. Continue adding three beads at a time and making more loops until your piece is the desired length. Although right angle weaving is easy, it may help to view videos of the process and try simple projects to perfect your skills. The following sites have resources that will help. Seed beading is an affordable and versatile hobby. Once you learn these basic techniques, you'll be ready to create gorgeous beaded jewelry and other fun items.